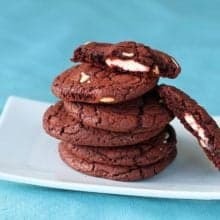 Cheater red velvet cookies made with red velvet cake mix and white chocolate chips, then filled with a delicious cream cheese filling! Combine the first three ingredients together in a medium mixing bowl. Add in the white chocolate chips and mix until combined. In a small bowl, combine the cream cheese and sugar thoroughly. This can be sweetened to taste. Take one tablespoon of dough, flatten slightly then place approximately 1 tbsp of cream cheese filling on top of it. Take another tablespoon of dough, flatten slightly then place on top. Pinch the edges together to seal the cookie. Place on a parchment lined cookie sheet approximately 2 inches apart. Cook for 12-15 minutes, until the edges are cooked and the middle is set. Remove from the oven and cool on baking sheets completely.